We seldom travel with sheep during the winter months, I would think that summer travel would be less stressful. The effects of transporting sheep were studied a few years ago in England. Groups of sheep were loaded into a trailer at a stocking density which enabled all the sheep to lie down. The groups were transported for up to 24 hours and traveled up to 700 miles over a variety of road types. During the journey most of the sheep stood up for the first few hours, but then many laid down. The sheep were able to rest and chew their cuds while the vehicle was in motion. When the vehicle stopped most of the animals stood up. Based on heart rates and blood tests, the process of loading and starting the journey was the most stressful part of the trip. Sheep then became adapted to the situation. There was an eight percent loss of live weight in the group that traveled without food or water for 24 hours, which was no greater than the loss observed in the sheep deprived of food and water for 24 hours in an untransported control group. Sheep were found generally better able to cope with transport than other farm species studied such as cattle, chickens, or pigs. Many of our trips across the country have been with sheep in the back of a pick-up truck. The truck, equipped with stock racks with open-slatted, airy sides, and a top for shade, became a comfortable home away from home for sheep in all types of weather. From our vantage point we were able to monitor the animals through the rear window of the cab. On long journeys over smooth expressways the animals quickly became relaxed and would lie down. When we stopped they would all stand up. When we stopped for an extended period of time to gas up or to eat, we would give them a few leaves of grassy hay. When we stopped for the night they would get hay and water with electrolytes. 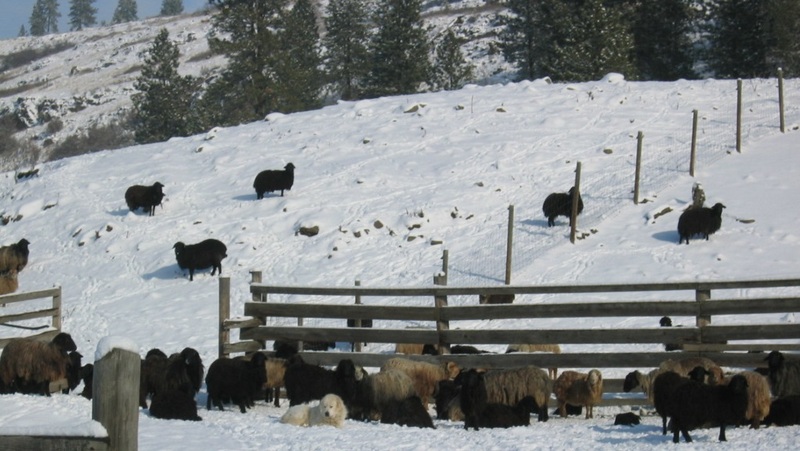 Sheep are very good, adaptable travelers; just remember to make adjustments for the wind-chill factor during the winter and the heat index during the summer. Transport distances and times should be kept to a minimum, since both involve psychological and physical stress. When sheep do have to be transported a great distance, it is best to travel uninterrupted because of the stressful initial stages of loading and transport.